The sunrise illuminates a significant portion of the newly acquired portions of the Castle Crags. The great jumble of granite spires known as the Castle Crags is one of the most easily recognized landmarks in the Mount Shasta area. Aside from the unrivaled cone of the great mountain itself, the Crags are the region’s most rugged and spectacular landscape. They are also among the areas most remote. 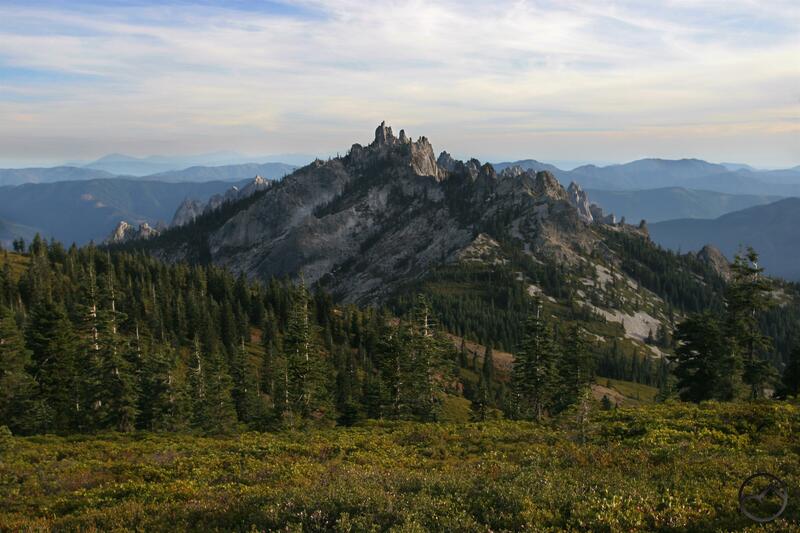 Even though the Pacific Crest Trail and the Castle Dome Trail, one of the most popular paths in the North State travel through the Castle Crags, the fact remains that the vast majority of this tremendous cluster of towers and domes is left utterly untracked by all save the most hearty and intrepid. The remoteness is in large measure a consequence of the Crags geography, which makes trail construction extremely difficult. Needless to say, the lack of trails is not an indication of a lack of fantastic scenery or destinations to explore. On the contrary, for those who do venture into the Castle Crags amazing sights await. Looking at some of the new areas (left and below the spire). Most of the Castle Crags falls under the administration of the Shasta-Trinity National Forest. The preponderance of this area is within the Castle Crags Wilderness, an administrative designation that protects against development. It may come as a surprise to many, but almost none of the Castle Crags actually falls within Castle Crags State Park. Instead, the park forms a girdle around the most easily reached sections of the Crags and essentially charges admission to hike to National Forest property. However, not all of the Castle Crags were open to the public. 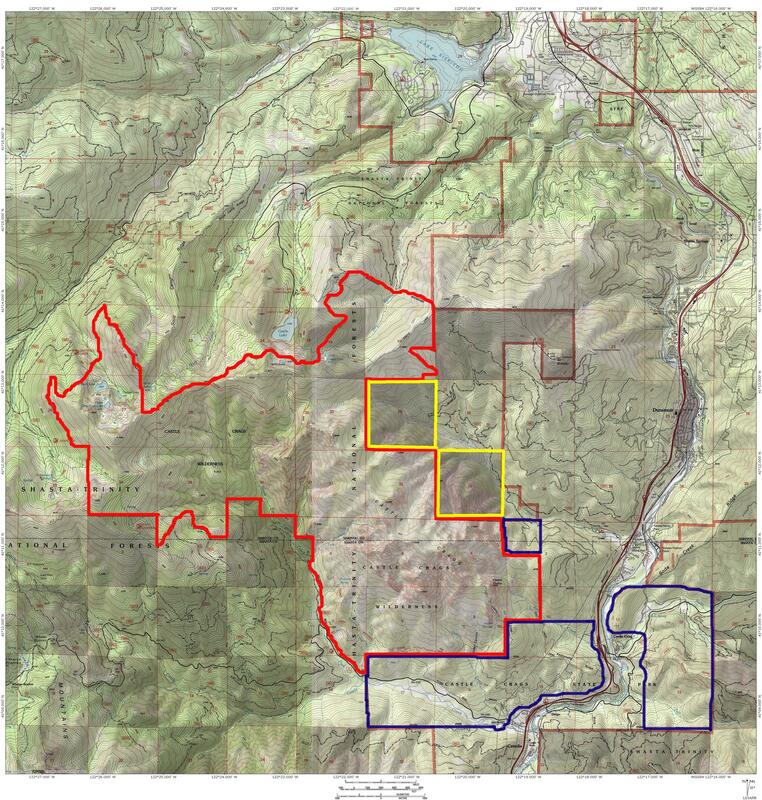 Two significant sections remained in private ownership by the Roseburg Resources Company. These two sections (a section being a measurement of land that is one square mile and contains 640 acres) are located on the rarely travelled north side of the Castle Crags and contain towering granite cliffs and spires as well as a significant portion of the Little Castle Creek drainage. Few traveled out this way, the majority of whom were dedicated rock climbers who sought out the towering walls for epic wilderness climbs. It was in the effort to ensure access for climbers that the Access Fund, an organization established to promote and maintain access to climbing areas, got involved with the effort to acquire these two gorgeous sections. Negotiations with Roseburg have been completed and a deal reached for the transfer of the two sections to a private trust with the ultimate intent to transfer the land to the Forest Service. This is a commendable achievement by all involved. The new land finally brings the entirety of the Castle Crags under unified management. This may lead to the land being added to the Castle Crags Wilderness at some future date. However, only Congress has the authority to take this action so it will be a while before any formal action is taken. In spite of this, the Forest Service will probably manage the area as a de facto wilderness area. Still, this area has fantastic recreational potential. Obviously rock climbers are the first to benefit, as are those ambitious enough to explore the canyons that penetrate the Crags’ north side. Hikers will no doubt foray into the area, whether there are trails or not. One potential addition to the area is a trail that climbs the Little Castle Creek canyon and links up with the Pacific Crest Trail. Such a trail would go a long way to creating a loop that would form a magnificent backpacking loop. No formal proposal for such a trail exists and many hurdles would await if the project were attempted but the idea has merit. 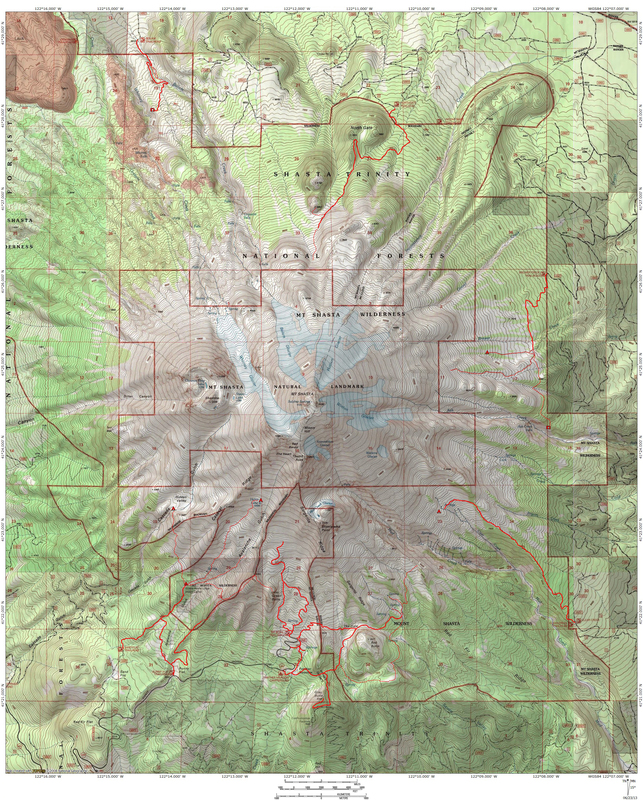 Map shows the extent of the Castle Crags Wilderness and the Castle Crags State Park. The new additions are marked in yellow. That sunrise shot is epic!